What is NDVI? What is NRG? We've been working a lot on capturing infrared imagery using our DIY near-infrared camera setup, and combining it with visible bands to produce NDVI images such as the one above. 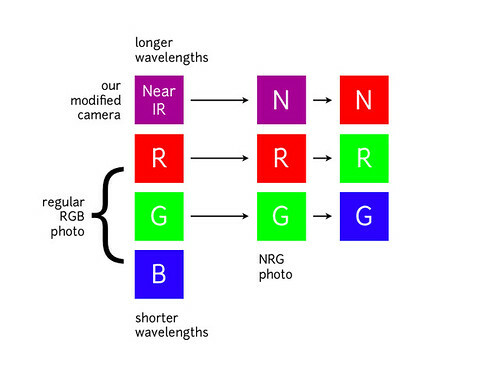 We're also interested in producing NRG imagery (like the below image), where Near-Infrared, Red, and Green are used to compose a picture instead of the usual Red, Green, and Blue. 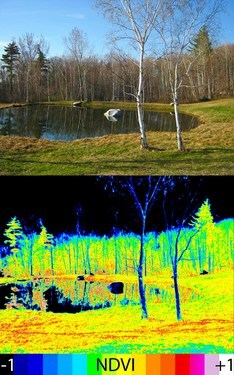 Figure above: Normal color photo (top) and normalized difference vegetation index (N DVI) image. NDVI image was derived from two color channels in a single photo taken with a camera modified with a special infrared filter[. ](https://toolshed.g2.bx.psu.edu/repository?repository_id=ab5f788f07073c11) Note that tree trunks, brown grass, and rocks have very low NDVI values because they are not photosynthetic. 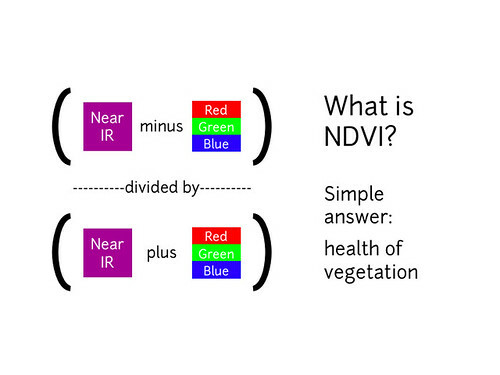 Healthy plants typically have NDVI values between 0.1 and 0.9. The result can be false-colored to make the high-photosynthesis areas more clear -- like the top image on this page -- and used to examine where plants are and how healthy they are. 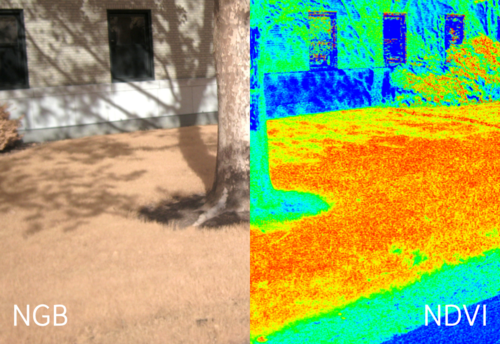 Figure above: Normal color photo (top) and normalized difference vegetation index (NDVI) image. NDVI image was derived from two color channels in a single photo taken with a camera modified with a special infrared filter. Note that tree trunks, brown grass, and rocks have very low NDVI values because they are not photosynthetic. Healthy plants typically have NDVI values between 0.1 and 0.9. We've been working a lot on capturing infrared imagery, and producing NDVI images such as the one above using our DIY near-infrared camera setup. 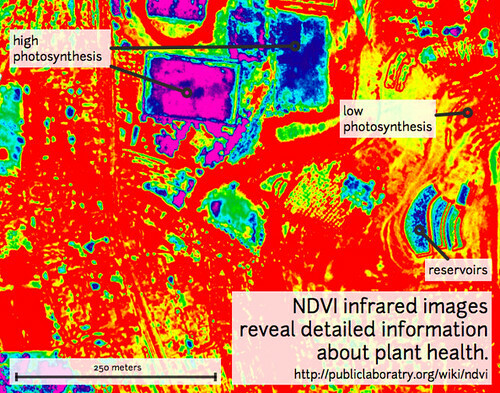 NDVI is a ratio which tries to emphasize photosynthesis while filtering out sun glare. The above equation is run for every pixel, using source data from an infrared photo and a visible light photo, like this pair. 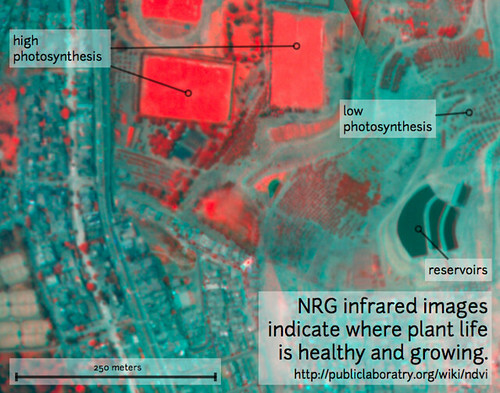 We've been working a lot on capturing infrared imagery, and producing NDVI images such as the one above. NDVI is a ratio which emphasizes plant health. The above equation is run for every pixel, using source data from an infrared photo and a visible light photo, like this pair. What are these images we're trying to make? What do they tell us about vegetation, and why? These diagrams should help to understand what it is we're doing and why these are good ways to analyze plant life. 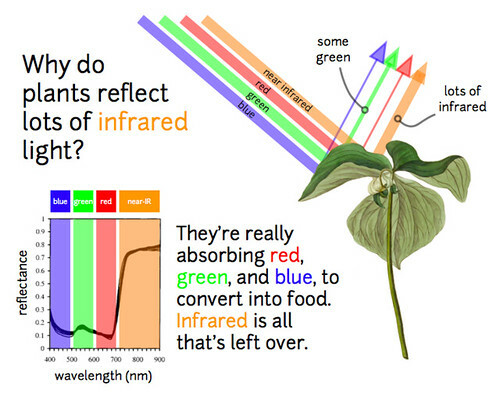 See, plants use visible light (mainly blue and red light) as 'food' -- not so much green light, which is why they reflect green away, and look green to our eyes. They also happen to reflect near infrared light (which is just beyond red light, but not visible to the human eye). This is because they chemically cannot convert infrared into useable food, and so they just bounce away to stay cool. The above image shows what colors of light plants absorb vs. reflect away. By using this unique property of plants, plus our ability to take near-infrared photos we can create composite images which highlight where plants are and how much they are photosynthesizing.